TrES-1 in a computer-illustrated simulation with its parent star. The planet is in the foreground and so appears larger than it really is compared to the star. The K-type star is slightly cooler and smaller than the Sun yet very active. The planet is about 10 times closer to the star than Mercury is to the Sun. With the help of a modified backyard telescope, astronomers have discovered a giant planet orbiting another star. It is the first extrasolar world found with such modest equipment. Large observatories pinned down the finding after 16 candidate planets were identified by a 4-inch (10-centimeter) telescope, in a professionally run search effort that uses off-the-shelf parts and complex computer analysis. The technique, now proven to work, promises similar findings ahead. Importantly, the process finds planets whose atmospheres can be probed with the Hubble Space Telescope, paving the way for a greater understanding of giant worlds around other stars. Hubble might even be able to detect a moon if one orbits the newfound planet. The planet is slightly bigger than Jupiter, circling a star 500 light-years from Earth, astronomers announced today. It is much closer to its star than Mercury is to the Sun, making a high-speed annual trip around the star in just 3.03 Earth-days. The planet is probably about 1,500 degrees Fahrenheit (816 Celsius), scientists said. Dozens of other extrasolar planets have similar tight configurations. The newly spotted object is called a transiting planet: It passes in front if its host star as seen from Earth, causing a slight dip in observed starlight that made the discovery possible. Only four other transiting planets have been discovered, all with large telescopes. "We're really excited about this result, both because it proves the validity of our approach, and because the planet itself has some interesting properties," said David Charbonneau of the Harvard-Smithsonian Center for Astrophysics and a co-leader of the Trans-Atlantic Exoplanet Survey (TrES). Most of the more than 120 known extrasolar planets have been found by an indirect means -- a slight wobble in the host star induced by the planet's tug -- that allows only a determination of mass and orbital characteristics. 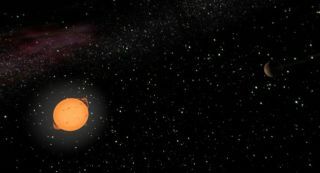 With a transiting planet, however, astronomers can learn the diameter and even what's in its atmosphere, by studying the shadow it creates against the star and the light that is altered as it passes through the atmosphere. Three of the known transiting planets are too far away to have their air probed, however. Another, named HD 209458b, was the first planet outside our solar system for which an atmosphere has been detected. The newest known transiting planet, named TrES-1, has not had its atmosphere examined yet, but its diameter has been roughly determined, and the result proved interesting. Like the three faraway transiting planets, TrES-1 seems to be "only a smidge larger" than Jupiter, Charbonneau told SPACE.com. "HD 209458b, on the other hand, has been studied by Hubble, and has a very precisely measured size -- which is about 40 percent larger than Jupiter, which is a very significant increase." Theorists have a hard time explaining the large size of HD 209458b, given its known mass. TrES-1, though smaller, is about the same mass, in line with what astronomers would expect of an object made mostly of hydrogen and helium, as is Jupiter. "Finding TrES-1 and seeing how normal it is makes us suspect that HD 209458b is an 'oddball' planet," Charbonneau said. The 16 planet candidates identified by the small telescope were then observed by others, including the 33-foot (10-meter) Keck Observatory in Hawaii. Most are stellar pairs -- a dim star passing in front of a brighter one, Charbonneau said. A few require additional observation to learn what they are. Meanwhile, Charbonneau and his colleagues hope to use Hubble to examine TrES-1 more closely. Hubble might find water in TrES-1, and it would "give us a much more precise measurement of the planet's size, and even allow us to search for moons," he said. A satellite is unlikely, however, given the likely history and current orbital configuration for the planet, the research team concluded. No moons have ever been detected beyond our solar system, but some researchers have considered that such satellites would be logical places for life to exist around giant gaseous worlds that otherwise could not be expected to support biology. Timothy Brown of the National Center for Atmospheric Research and Edward Dunham of Lowell Observatory co-led the development of the TrES program. The discovery will be detailed in Astrophysical Journal Letters.